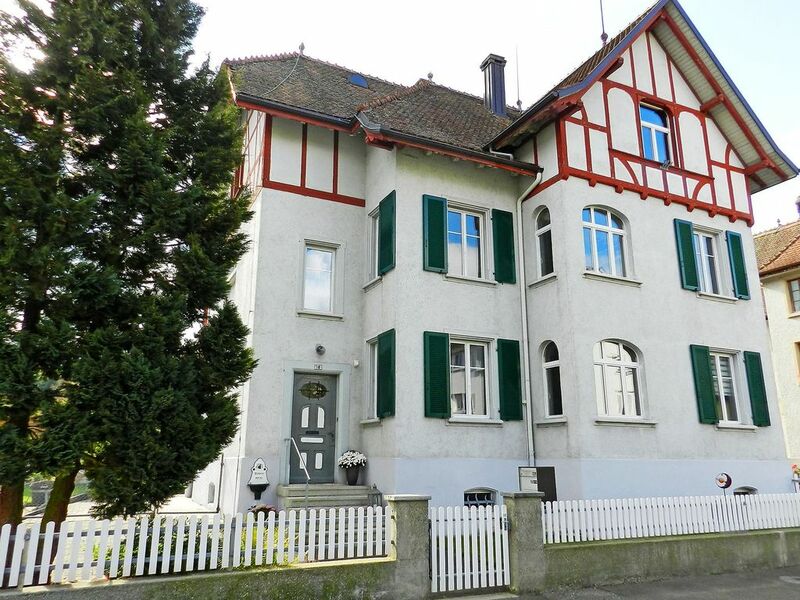 Steckborn 15 km from Konstanz: Cosy 2-family house "Morgenstrasse", 3 storeys, built in 1910, renovated in 2016. In the resort, 300 m from the centre, in a central, sunny position, 600 m from the lake. For shared use: garden 50 m2 (fenced), lawn for sunbathing 30 m2. Barbecue. In the house: central heating system, washing machine, tumble dryer (for shared use, extra). Motor access to the house. Parking (for 2 cars) at the house. Grocery 300 m, supermarket 700 m, restaurant 300 m, railway station "Steckborn" 600 m, outdoor swimming pool 1 km, lake Bodensee 300 m. Tennis 800 m, cycle lane 300 m, children's playground 600 m. Nearby attractions: UNESCO Klosterinsel Reichenau 7 km, Stein am Rhein 10 km, Napoleon Museum / Schloss Arenberg 6 km, Konstanz 15 km, Insel Mainau 17 km, Schaffhausen - Reinfall 30 km. Well-known lakes can easily be reached: Bodensee (Untersee) 600 m. Please note: the owner lives in the same residence. Railway line 15 m from the property. 3-room apartment 86 m2, on the upper ground floor. Comfortable and stylish furnishings: living/dining room with 1 sofabed, dining table and satellite TV (flat screen). 1 double bedroom. 1 room with 2 beds. Kitchen (4 hot plates, oven, dishwasher, electric coffee machine) with small bar. Exit to the garden, to the terrace, to the patio. Shower/WC. Small terrace, patio 20 m2. Terrace furniture. Facilities: Internet (WiFi, free). Reserved parking (2 cars) at the house. Please note: non-smokers only.